You will know when I have too much time on my hands, when I start playing with my food. Something my father would disapprove of, but I hope he will forgive me this time as I'm just looking for a little sunshine and some smiles. 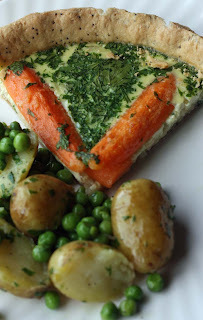 The sliced carrots in this savoury Carrot flan represent bursts of sun ray; maybe even petals from a flower. This Carrot Parsley Flan recipe is based on a Rainbow Carrot and Runner Bean Flan I made a couple of years ago with home grown vegetables. I've made one change to the pastry, I added some poppy seeds for texture, it was a pleasant change from a plain pasty crust. This is a very light flan, so is best served with some Spring vegetables such as Jersey New Potatoes, spring onions and peas. I made my pastry by hand, but for ease you can also use a food processor. Soften onion in olive oil without browning for about 10 minutes, then add the carrots and cook until tender. Remove the carrots from the pan. Whisk the milk with the egg, add the cooked onions, parsley and season to taste. 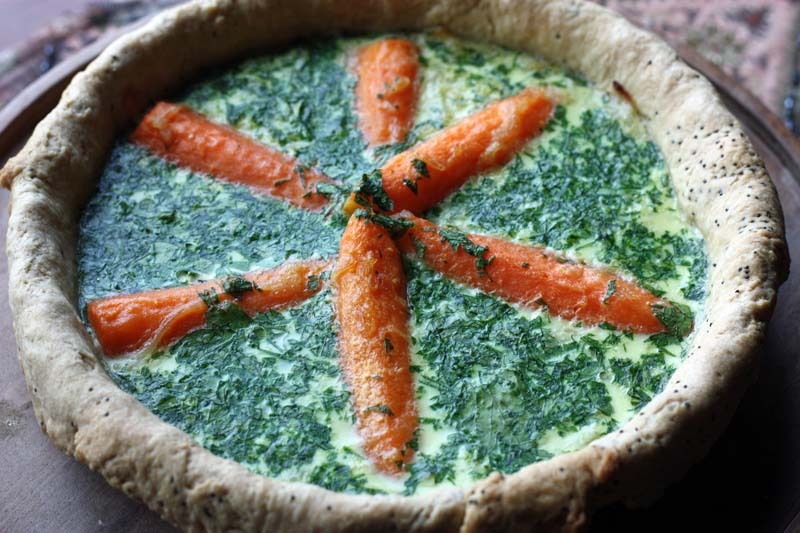 Arrange the carrots in the flan base. Then pour the egg-onion mixture into the flan case. Bake on gas mark 5 for 30 – 35 minutes until set. Allow to cool. You can do this part when you have blind baked the pastry, these days I prefer to remove the overlapping pastry crust when the flan is completely cooked. I like the whimsy in the placement of the carrots. So cute! 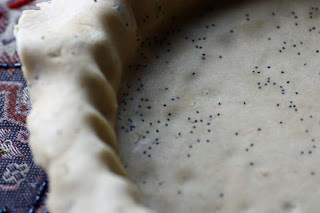 My husband likes poppy seeds on almost everything, so I'm sure he would enjoy this crust! This looks amazingly healthy, and easy to prepare. The carrots in the sun rays look uncannily like the ones I prepare when I cook whole baby carrots by tossing them in a pan until brown.. and then sprinkling with some ground pepper! Saving this Carrot flan recipe of yours to try out over the weekend. Many thanks for this. I like the idea of putting poppy seed into the dough. And it's a lovely display with carrot spokes! As long as the playing results in such appetizing food, I think it's completely o.k. to do so! This looks absolutely GORGEOUS! I can't wait to get some fresh carrots from my local farmer's market so I can try. I've even got some fancy poppy seeds I've been dying to use. Thanks so much for posting! This just looks fabulous. You are so creative! Carrot flan! How did you come up with such a thing? Genius. I've got to try something like this soon. Thanks for stopping by my blog, otherwise I never would have found yours and this is great! 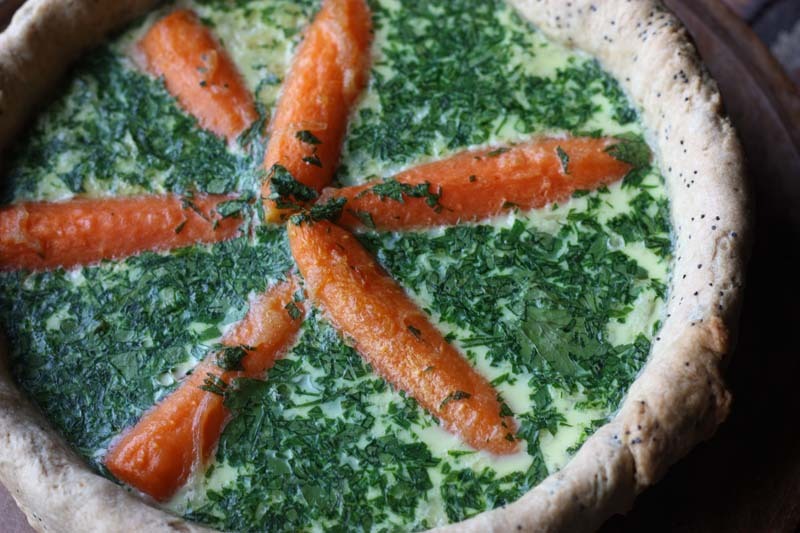 Your beautiful carrot flan is a show stopper. The way you have arranged the carrots allows those lovely slices that are so pretty on the plate. And poppy seeds are a very nice addition to the crust. Your flan is so lovely! Thanks for visiting my blog :) You have a wonderful space and the photography is gorgeous! Lot to learm from you :) I am following you and would ike to invite you to follow me too if you like ! I bet that tastes as good as it looks!! Thank you so much Brenda of My Backyard Farmyard. It did feel healthy eating it. Please let me know how you find it if you do get roudn to making it this weekend. For coming by and repaying the compliment. The flan is an adaptation of a recipe I've made before. The presentation was, well ...me being arty ...well sort of. I am looking forward to reading your blog and your culinary creations. It was delicious, the last slice went this afternoon! Ah sometimes it's good to play. I think us adults can be far too serious sometimes. Hi! I am so glad I found your blog, your food looks so natural, homemade, delicious! I am going to try the pumpkin pie. I love all the vegguies pies! I love all those vegguis flans, In my country we only make them super sweet, with caramel , I need to try your recipes :)delish! Blogger was down yesterday and i had responded to all of your comments on a 121 on the 11th, but they seem to have all gone lost.